L-Lysine is one of twenty essential amino acids that function as primary building blocks for the production of many different proteins. Because the human body is unable to synthesize L-Lysine, it must be obtained from external sources. Supplementation may be necessary when diet alone does not provide adequate amounts of L-Lysine for optimal health and well-being. 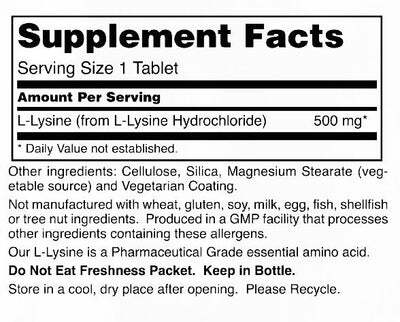 How does L-Lysine support health? Contributes to the formation of proteins that are necessary for many biochemical processes to occur. Promotes healthy bones and skeletal integrity. Used to prevent different types of harmful protein deficiencies. Helps to maintain healthy immune system activity.